"HE'S one of the boys." 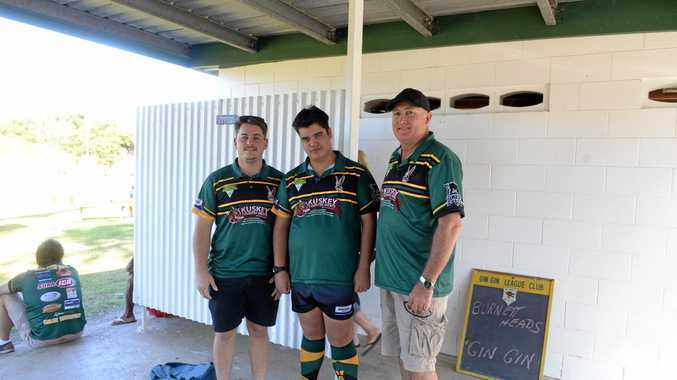 Wearing green and gold with pride, Gin Gin Hawks team member Kail Horne said while he has Autism, it won't be stopping his love of rugby league. This is the eighteen-year-old's first season as part of a team in the Northern Districts Rugby League and it won't be the last. "It's just the sport that I like, after watching a couple of matched on TV I thought 'this looks easy lets give it a go', " he said. "It's been pretty good so far, I haven't played yet but I fill up the water bottles and last they needed someone to run the kicking tee so I did that. "I'm from Wallaville area and I come here because it's the nearest league club I can find. Kail has High Functioning Autism but says he's 'basically over it now'. "To be honest as a kid I never really caught on, the only time I caught on was in mid-high school, nearly at the end," he said. The Statsman as his fellow players call him, is full of rugby league knowledge - every player, team and point Kail's up-to-date with it all. "At the start of the year, I don't know how Kail found out about us and I got a phone call from him," Gin Gin Hawks club president Mick McCotter said. "I knew of him through the school, because our club does a bit with school and I asked my boys about him and we understood that Kail has Autism but hey he just wants to be part of a team and make some mates. "Rugby league, in my life, has always been great for mates and I couldn't think of a better way for a young fella starting out in his working life to get in with the footy team and club - he's been great." Having only missed one session and actively participating in training, Mr McCotter said Kail has even "sat a few of the boys on their bum" during training. Kail said he loves having a laugh with the boys and the support they all give him. "The main thing is the support I'm getting an I'm getting a lot of friends," he said. "I don't plan to be popular, just to have a good life and a good legacy. "I always have fun, even at away games." Team-mate and Gin Gin forward, Ashley Helmore said if there were 15 of Kail you'd never have to worry. "He is one of us," Mr Helmore said. "He's always at training and you can ask him anything to do with football and he'll tell you. Kail gets involved on the field at training, channelling some of his favourite half-backs and the great Jonathan Thurston according to Gin Gin coach Benjamin Kuskey. "There's some things that are a bit hard but, he gets in and has a chop with the boys," he said. "It's good for him to be around everyone and they all get along great." Mr McCotter said it's great to have him as part of the club. "He's a real club person, he can't do enough to help us," he said. "All the politics at the moment with Pauline Hanson, there's nothing wrong with these blokes, just give them a go. "They're good kids - Kail's been nothing but good to us and I'll help him to the ends of the Earth." Gin Gin take on Burnett Heads at the South Kolan footy grounds this Sunday, in the NDRLs 15th round.